Don't worry, I wont be reviewing a 20 to Make book every week although I must say, they are great little guides with inspiring ideas for any 'craft'. I do own a few. It just so happens that along with my 20 to Make Mini Christmas crochet, I also received this book which you can find to purchase here. 'Hold on' I hear you say. You want to hear a bit more about it? Firstly, I am not a knitting pro. I am very much a beginner and I know the basics. I found the patterns in this book particularly easy to follow. I did have to google a couple of the terms for a video on how to do it, just to make sure, but overall, I found it surprisingly easy to put this little guy together which was based on 'Toby Toddler Bear'. I substituted the black bead eyes for goggly ones and I did miss some of the embellishments but I never was one to do things exactly by the book. Heres how he should of looked. Pretty close I think. The layout of the book is very simple. There is a pattern to make up a bear (choose the colour from your pattern first) and then you pick one of the lovely bear designs to make up the costume for the bear. I purchased the book for my Nan who had been nosing at mine. She stated upon receiving the book "Thanks but I wanted you to make one for me." So Emily Knitting Bear is next on the list! One very frustrating thing was the lack of clear instruction on how to sew up the pieces of the bear. I had to find a video on how to this but the term used in the book would not return adequate results when searching on the internet and it took me a while to figure out how to sew up the bear with the right stitching. Having said that, this book is not an instructional book and as with the Mini Christmas Crochet, a pictorial knitting instruction book for those lacking experience in the terminology and techniques, or access to google, would be a great help. For what it is, a lovely collection of costumed bears to knit up beautiful little bears for yourself, friends and family, this book is well varied and you will find a bear for everyone from a sports enthusiastic to a beach babe, from graduates to gardeners. Well worth adding to collection if you like to knit such figures or would like to get started with some inspiration. Ok so quickly, whilst I'm here and before I have to pour the last of my energy into Baby B waking up from his nap, I'm going to start a project which will be a featured as a 'book browse'. I'm going to crochet the cushion in Cath Kidston's 'Crochet Book'. I think I am also going to to pick something to make from 'Stitch', because lets face it, you aren't a true crafter without more than one project on the go. In other news, I still have a cross stitch sampler on my list of projects to do, unfinished knitting and crochet as well as other unfinished bits in the drawer and I have been turning my hand to a bit of 'designing' but these are projects to be shared in good time. How are your 2013 projects coming along so far? You should know that the maker of these little beauties, does indeed sell them. I thought it was important to get that out there. Well, it would be a shame not to share these with the world, right? As hard as it is, lets move on from oogling these amazing bakes and meet the maker. As we settle for our interview we must first ask two very important questions. It depends on the time of day! I can never get started in the morning without my brew (PG Tips all the way – white, no sugar) but as an ex-teacher, to dismiss coffee in favour of tea also lacks foresight – you never know who or what you’ve had to put up with before that 10.30 bell which often only coffee can fix! Cake – which is ironic based on what I do, but there’s a very obvious reason. Cakes are soft, squidgy and gooey. Biscuits are crunchy…which in my book is all wrong! My business is based around a gooey, moist, soft cookie that simply melts in your mouth! Top of the list is lemon drizzle cake, closely followed by chocolate fudge. I’m Sarah Kerley, 27years old, wife and mum from Longstanton. I was a teacher for 5 years – 3 years in Sussex and then 2 years in a leadership role in a large school in Cambridgeshire before I became a mummy. My business name is “Kerley’s Cookie and Canape Creations” which is very new and is therefore blog-less / website– less at present, but I’m currently operating by word-of-mouth which really has a nice cottagey feel to it! Home baked, individually hand crafted chocolate delicacies. How long have you been baking and how did you learn? I’ve always baked – initially taught by my mum as a 5 year old child and then self-taught from a collection of carefully chosen recipe books once I left home! I’ve always loved it and this is how I came to set up in business as a producer of food. When did you start Kerley’s Cookie and Canape Creations and why? My business began when I decided not to go back to my teaching job after becoming a Mum in March 2012. I was in a very fortunate position of having a very contented baby and found that I had a bit of extra time on my hands each day. I asked my husband how I could fill these couple of hours as the baby slept, and he suggested trying to improve on my cooking hobby, being adventurous, branching out into new things and trying new ideas. One day, I found a new cookie recipe and made it. It wasn’t quite to my liking but I thought it had potential to be a family winner, so I changed a few things, added a “secret ingredient” and out popped a gorgeous, gooey, double-choc cookie. My friend came round for coffee and as they were just out of the oven I gave her one, and the response was something along the lines of “woah, these are amaaazing! I would pay good money for one of these!” So this was my moment when I thought – well, people who craft are just living out a hobby – why don’t I try and sell a few? So I went to my first craft fair not knowing what to expect and sold out! Everyone’s response was the same – “These are really good, but not expensive” (I charge 79p per large cookie at craft fairs, 30p per cookie for bulk orders). I chose not to charge the earth for them, as it’s just a hobby I want to share with others. If they love them enough to shell out a few pennies on them – well it makes me feel amazing! The whole thing started as “Kerley’s Cookie Creations” and then someone at a fair said “They’d be good as a nibble at a corporate event or a fashion show – why don’t you branch out and do different flavours as well as a canapé style cookie?” Then “Kerley’s Canape Creations” emerged – the idea that a simple cookie can actually be a sophisticated and interesting sweet canapé – a focal point for any social event, be it party, office, wedding, christening or the like. I nervously attended my first wedding fair (see pictures attached) with a chocolate themed canapé selection and it went down a storm. The idea is that actually, contrary to what other businesses were suggesting at the wedding fair, feeding your guests does not have to be expensive. If you have an evening event and have already paid the earth for a sit down meal why not get your waiters simply to float around with chocolate canapés for your guests to choose from. They are yummy, moreish, sophisticated and they are cheap – yet they don’t look it. The reason they are cheap is that I just love this new lease of life, love what I’m doing and don’t see the word “wedding” as an excuse to add a huge price tag. So I charge what it costs to make plus a little extra to ensure I am not in the red on petrol, packaging and oven running costs. I would like to share with you a heart shaped choc chip cookie, fresh from the oven - perfect for sharing! This is the plate of sweet chocolate canapes that kicked off the wedding orders in the Autumn of 2011 and made me realise there was so much more that I could do with my business than selling a simple Millie's style cookie at my local craft fair. So, whilst the business actually started with a double choc chip cookie (My most popular creation by far in the form of a dark chocolate flavour in a rich but moist, gooey cookie dough, yet as you bite through, you experience the crunch of large white, milk and dark chocolate pieces. The perfect contrast in a mouth melting dough! ), the adaptation of that cookie - a plain vanilla or almond cookie covered in chocolate like the one you see in the picture fits better with a sophisticated platter of sweet treats for a wedding reception. I’m inspired by success, a sense of achievement and a sense of purpose. I’m motivated to do what I do because my baby was an amazing gift and I feel really privileged to be at home with him, but before him I thrived in a stressful job where I organised teams and dealt with problems all day whilst trying to teach to a high level and achieve great things with amazing children, so I need a little bit of that in my life to ensure I don’t get that rusty housewife feeling – I’d be lost without a sense of purpose, success and achievement. Meanwhile I don’t want to lose that feeling of loving being at home with my little boy, so need something a little bit extra to do to fill an spare moments and earn some pennies of my own for that sense of satisfaction! Having a phone call from someone putting in an order for 50 cookies for a child’s birthday party the next day gives me a brilliant feeling, a target to meet (if you’ve ever worked in a school you know you live for these!) and gives me even more drive to spend quality time with my little man when he’s awake because whilst he’s slept I’ve been fulfilling a dream! Spring – it’s full of hope and expectation! Roast Leg of Lamb – and of course Kerley’s cookies – cherry and almond flavour win for me! As a child, I made a very important discovery in the woods beside my parents’ house where I used to walk my dog. Near a lake was a large clump of trees. If you clawed your way into the middle, they opened up beautifully to create a sort of perch / seat from a criss-cross of branches. As far as I knew nobody else ever found it / knew it was there, and I could sit and dream or read for hours looking over a lake and nobody other than my dog would know I was there! It was an amazing, dreamy place which I named “Thinking Clump”! Having my beautiful baby boy. Kerley's Cookie Creations........The Melt in the Mouth Cookie that always has you coming back for more! Available in many different flavours and handmade especially for you, these are a luxury cookie at a low price! I also take bulk orders for family events, kids parties, weddings or a function of your choosing and also personalise cookies with "Thank you", "Happy Birthday", "Get Well Soon" or a message of your choice. I produce boxes of cookies for end of term thank you gifts for teachers or TAs and these come gift wrapped. Flavours include choc chip, double choc chip, almond and cherry, smarties, m&ms, oat and raisin or magic stars. …and…Kerley’s Canape Creations…The Melt in the Mouth chocolate canapé – sophisticated, yummy, moreish – the luxury sweet canapé at a low price! Available in different flavours and designs, personalised or plain and delivered in display boxes ready to put out at your function or corporate event to wow your guests – they’ll never know how little you paid! Thank you so much Sarah for taking the time out to tell us all about you and your baking adventures! If only we had 'taste' screens!!! I am excited about meeting the maker of this lovely bag. Can you guess why? A girl after my own heart. I love a bit of crochet. I would love to blurb a bit more but this post is all about our next maker. So lets get on with it! Coffee and lots of it! With a little milk and sugar. Caroline Bradshaw, happily married to maths teacher hubbie with a beautiful daughter who has just turned four. Originally from Mid-Wales, now living in Dorset. My business is called 'Caroline Makes it', my items are available via http://folksy.com/shops/carolinemakesit and from Sherborne Tapestry Centre. You can keep in touch with me through my blog. My items are either knitted, crocheted or occasionally sewn, I concentrate largely on accessories, hats, scarves, jewellery etc. My life is split between looking after my family, crafting, working part time at Sherborne Tapestry Centre and volunteering one day a week at our local Sue Ryder charity shop. I would like to share with you my latest make, a Granny Square Bag. The design is proving really popular at the moment, with the resurgence in popularity of all things crochet! It has been hand crocheted using a mix of Aran and Chunky weight yarn, in cream and a lovely colourway called 'Irish Rose' by Sirdar. It is currently available from my folksy shop. I love the versatility of the Granny Square design, you are only limited by your own imagination! My main craft at the moment for retail is crochet, I find it works up quickly and produces beautiful textures and finishes, I am also an avid knitter, although I largely knit for family and friends at the moment, but it is not uncommon to find knitted items on my site alongside the crocheted ones. I have recently inherited a beautiful old Singer sewing machine from my grandmother, it dates from 1902, so my next mission is to master that! I have been knitting since a small child, my Grandfather and later my Mother taught me all they knew. It was also my Mother that last Easter (2012) sat me down and showed me the basics of crochet! I took a beginners crochet course at Three Bags Full in Yeovil, run by the wonderful Avril Best from Rowan last September, that took my skill beyond chains and trebles! When did you start 'Caroline Makes It' and why? I started 'Caroline Makes It' September 2012 in response to various positive comments from family and friends who had bought my work. I find inspiration in all sorts of places, I often buy yarn before knowing what exactly I am going to do with it, and see where it leads me! I love trawling through second hand shops for ideas, items I can up-cycle or modify. My motivation comes from my wonderful family and friends that have so much faith in me. Crafting heroes is a difficult one, I'm a big fan of Kirstie Allsopp's programmes, although most of my inspiration comes from books. Some of my favourites at the moment are by Erika Knight (I love the crochet designs), Val Pierce (her baby knits are gorgeous) and Tiff Fussell & Rachelle Blondel (their book Granny Chic is my new bible). What are your plans for 2013 Caroline? It's set to be an exciting year, there are a few new partnerships and opportunities on the horizon, I am hoping to expand my product line on Folksy and with the items I stock at Sherborne Tapestry Centre. I am interested in developing new jewellery designs, particularly using wire for knitting and crochet. So, can we join you in your virtual world? 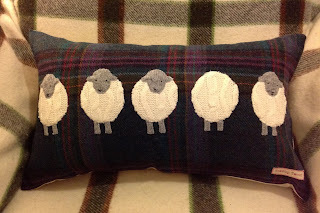 You can find me in the following virtual places - http://folksy.com/shops/carolinemakesitt . On twitter @carolinemakesit , on pinterest 'Carolinemakesit' , my new blog is at carolinemakesit.blogspot.co.uk , I'm also on ravelry as 'carolinemakesit' and finally on Facebook 'Caroline Makes It' - that's a lot social media, isn't it! A few quick fire questions for you. Home with a warm cuppa and some yarn! I'm online for the first time in a while catching up on emails etc. I couldn't sign out without a quick blog post to let you all know I'm still here! I've also picked up my crochet hooks because I am desperate to share some tutorials. First I must magic time. I occasionally get crochet fingers when I haven't done any for a while. My hands feel like they really need to be doing something and that something is crochet. 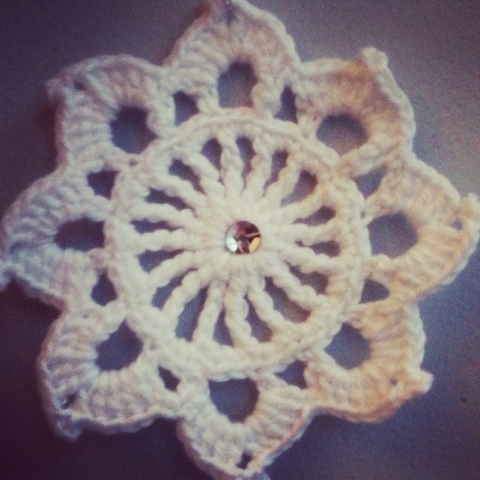 I made up a few granny squares and sketched a few designs and then turned my attention to Pinterest. My new obsession! Woah. Inspiration galore huh? Anyway, I must sign off to get a bit of crafting in before I call it a night. I hope you all have a great week. My blog is almost 1 year old. I feel that I have used it as intended to share my projects and crafts but now I love creating the blog itself so I hope to spend some more time giving my lovely community something extra to read with a few new features. The first feature to be introduced is 'Meet the Maker'. I am passionate about handmade and the art of crafting and when the question is posed 'what makes one handmade fabric heart different to the next?' the answer is simple. It's the person that made it. Everything handmade is unique as is the person that created it so I want to provide a platform for us to meet the people behind the beautiful pictures of those handmade things that you love. I hope that over the weeks we can get to know makers on all levels from craft business start up to mums who bake. Magazine editors to designers. Artists to business professionals who have a crafting hobby. In time I want to look back and see just how vast the handmade community is and dispel the common misconception that crafting is knitting grandmas and handmade cards made by housewives. If you have seen a picture of a lovely handmade item and you would like to meet the maker, please send me a link to the picture. Perhaps you would like to share one of your handmade items and be interviewed about your blog, business or crafty hobby. The only criteria is that the item must be handmade by the person being interviewed. Get your pics in quick to mrscraftyb@gmail.com and I will respond with your interview and the date on which your interview will be posted. I look forward to hearing from you and getting to know lots of new people in the handmade community. Meet the Maker will launch next Tuesday 15th Jan when we meet the maker of this lovely cushion. Don't miss it. It's all about the maker so please check back in next Tuesday. 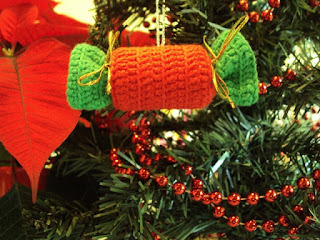 For Christmas 2011 Hubby B bought me '20 to Make Mini Christmas Crochet'. At the time, I started a couple of the projects but lost momentum as Christmas had been and gone. 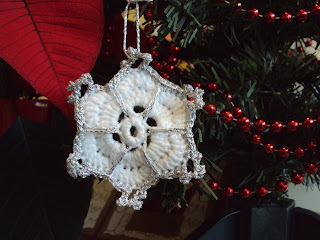 I picked up the book again for Christmas 2012 to make a few lovely things. Admittedly it did come out shortly after Baby B's birthday in August. The general design of these 20 makes are beautiful and allow you to make them your own, with equally good results. I didn't follow the instructions to the letter but I was still happy with the results. The patterns in this book are easy to read if you are familiar with crochet and the terminology. If you are a beginner you should not be put off. As long of you have a reference book to guide you with the basics of crochet, you will be able to cross reference and use one of the more simple patterns as a starter project. Most of the makes are great for hanging on the tree with the addition of some ribbon or simply placed on the mantle for everyone to enjoy. Others would make ideal Christmas gifts, stocking fillers or for me, some cute additions for Baby B's advent calendar. You could perhaps add a small keying to some of them to make a key pendant as a gift for a loved one so they can use it all year round. In conclusion, I would recommended this book for anyone wanting to add a bit of cute crochet to their festive decoration or wishing to craft Christmas gifts regardless of their level of crochet ability. Beginners will benefit from a second book with pictorial instruction of the basics in crochet. This book can be found here and a few of my 'makes' are pictured below.